This study examined how Indian Tribes use Social Security Act, title IV-B, subpart 2, funds, to provide services that strengthen families’ abilities to care for their children. 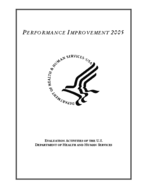 In 1993, title IV-B, subpart 2 was created within the Social Security Act to provide funding specifically dedicated to child welfare preventive services. Originally named the Family Preservation and Family Support (FP/FS) Services program, the program’s scope was expanded in 1997 and was reauthorized as the Promoting Safe and Stable Families (PSSF) program. In addition to the original two service categories (family preservation and family support) established by the 1993 legislation, the 1997 reauthorization also targeted funding on two new categories (time-limited family reunification and adoption promotion and support services). This study documented the process of implementation by focusing on planning and monitoring processes, service delivery systems and resources utilized by Tribes. As context to PSSF implementation, the full range of child welfare and related human services utilized by Tribes was explored, along with the resources used to fund these services. A total of 12 Tribes representing a wide array of practices in terms of service delivery, funding and resource utilization and collaborative arrangements were visited in-person. This study provided a historical perspective on Tribal implementation of the legislation. It explored how the usage of funds had evolved and how effective the funds had been in meeting the goals of PSSF and addressing the needs of American Indian children and families. The report highlights promising practices Tribes have adopted to meet the unique challenges they face in managing services to strengthen Tribal families, children and youth. A major finding of the study is that there is no single story of Tribal PSSF implementation. The flexibility of the program allows each Tribe’s approach to reflect its unique history and context.